24 more episodes of office hijinks are bound for Blu-ray this September. 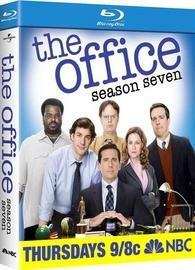 In an early announcement to retailers, Universal will release 'The Office: Season 7' on Blu-ray on September 6. The seventh season says farewell to Michael Scott (Steve Carell) as branch manager at Dunder Mifflin. The 4 BD-50 disc set will feature 1080p video, a DTS-HD Master Audio 5.1 soundtrack, and bonus features will include: "Nepotism" commentary with B.J. Novak, Craig Robinson, Creed Bratton, Charlie Grandy, and David Rogers; "PDA" commentary with Greg Daniels, Ellie Kemper, Angela Kinsey, Brian Baumgartner, Claire Scanlon, Kelly Cantley, and Robert Padnick; "Threat Level Midnight" commentary with Paul Lieberstein, B.J. Novak, Creed Bratton, Craig Robinson, and Daniel Chun; "Goodbye Michael" commentary with Greg Daniels, Ellie Kemper, Angela Kinsey, Brian Baumgartner, and David Rogers; "Dwight K. Schrute, (Acting) Manager" commentary with Mindy Kaling, Ellie Kemper, Angela Kinsey, Steve Hely, and Justin Spitzer; Threat Level Midnight: The Movie (A Michael Scott Joint); Deleted scenes; Blooper reel; and Webisodes: The 3rd Floor. Suggested list price for the Blu-ray is $59.98. You can find the latest specs for 'The Office: Season 7' linked from our Blu-ray Release Schedule, where it's indexed under September 6.